Teaching kids goal setting is an invaluable gift, but one that must not be overlooked. If we were to take a survey of adults, many would say they know how to set goals, but most would admit they don’t know how to achieve those goals. That’s why so many people get frustrated and feel like failures. They feel as if they are stuck in the mud simply spinning their wheels. You see, they were never taught how to set goals and think big. As teachers, we have the ability to make an impression on future adults by equipping them with lifelong skills. So, we need to make sure that we take the necessary time to teach our kids how to set achievable goals, practice this skill over and over, and then give them the courage they need to dream big and achieve. However, learning to try harder than the day before is a skill that will help your learners overcome every obstacle they encounter. Deciding to work harder than ever will help them take ownership of their learning, and give them a vested interest in the outcome. If they feel as though they are doing everyone a favor just by being present in class, they will never be successful. However, if we can get them focused on beating their best time or getting one more right than they did the day before or the week before, they are vested. And that is how we get them achieving. As I said before, most adults struggle with the concept of goal setting based on the fact that they don’t really know how to set appropriate and meaningful goals. Many people know what they want the end result to be, but they don’t always know how the path will look along the way. So, this just proves how important it is for us to help kids learn to set goals following the SMART method. In other words, the goals should be specific, measurable, attainable, relevant, and timely. 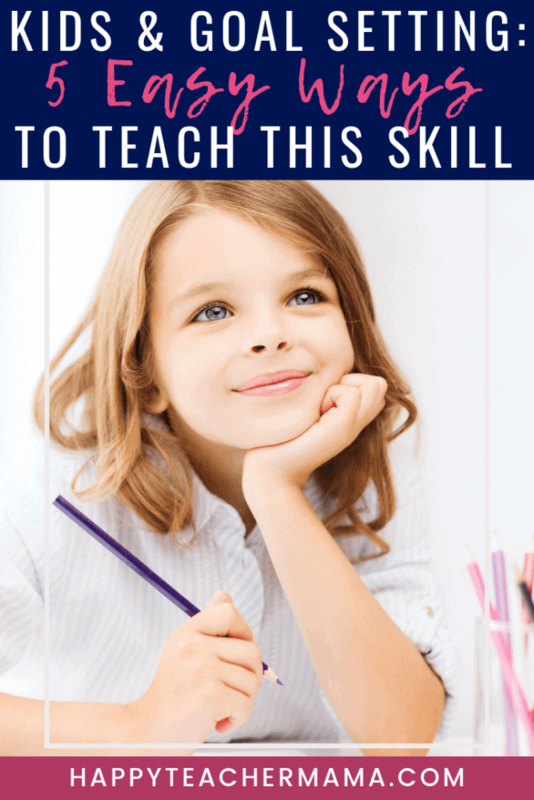 Now this may seem like A LOT of information, but I promise, it’s possible teach kids goal setting. Our job as teachers is to help them understand what each of those words means and how the words affect the goals we set. I have always found that examples are a wonderful way to understand new concepts. So, let’s use the example of a spelling test. An ineffective goal would be for a student to say “I want to do good on my spelling test this week.” This goal is timely because the student wants to achieve the goal this week and the goal is specific to spelling. However, it isn’t measurable, attainable, or relevant. Sure, we know what they “mean” by this comment, but to help them feel accomplished they need to rephrase this goal. A good example of an effective goal would be to say “I want to get 10/20 on my spelling test this week.” While that number would only be equivalent to a 50%, the student has set a goal that is specific, can be measured, is attainable, relevant, and timely. We all need little wins to give us the courage to continue…especially when it’s something new and a little scary. Teaching kids goal setting is no different. As we begin introducing this relatively vague concept, we want to start them on a path of success with a few small wins. Using the same spelling example as before, you could begin by encouraging them to earn 10/20 on their weekly spelling test. While this is only 50%, it still meets the criteria for a good goal. Have your kids write that goal in the top left hand corner of their paper. Then when you grade it, they can compare their goal to the actual result. Hopefully, they will get 20/20, but the whole point is to set the bar lower than you typically would just to help them see themselves as successful. For perfectionists and A students, this will sound ridiculous. However, it will be exactly what some of your lower achieving kids need to build up their confidence. In all honesty, it will help your A students and perfectionists, too. It will help them realize that they aren’t always going to make perfect scores and that is completely acceptable. As long as they are giving their best efforts, the results will come! As with any skill worth having, practice is the key. This isn’t one of those skills you can simply introduce and say you taught it. It needs to be practiced regularly. And, one of the easiest ways to practice goal setting is by using tickets out the door. This is a method of having kids post what they have learned throughout the lesson. As the teacher, you have the ability to ask any question and they will answer it on their ticket out the door form. My favorite way to do this was to use post-it notes. My kids would put their answers on those, and then stick them on the bulletin board beside the door. Each child was assigned a number and they would put their post-it note with their number. To effectively use this for teaching kids goal setting, hand out the post-it notes at the beginning of class. Have them set a goal for themselves. Then at the end of class your students can explain whether they met, exceeded, or didn’t meet their goal. As an added level of reflection, have your students tell what they feel like their levels of effort were. Did they give their absolute best efforts, or did they slack a little today? You’ll be amazed at the level of honesty from many of your kids. The last thing for you to consider when teaching kids goal setting is thinking big. Most kids can’t think outside of what they are doing for lunch much less what the future holds! So, getting them to think long-term is going to be the most difficult part of setting goals. In the rural area we live in, many kids don’t envision much, if anything, for themselves in the future. Some have big plans, but most don’t even know how to think outside of our little town. Unfortunately, this perpetuates a cycle of lower achievement. Why work hard when there is nothing to work hard for? So, this is why encouraging students to think big is crucial. Getting them to think about their future helps them envision what it would be like to actually achieve or even surpass those big goals. For some, it will be to simply graduate high school. For others, it will be to graduate from college or become a doctor. While teaching kids goal setting is not a quick fix, it is a skill they will use for the rest of their lives. No matter how small or how silly the goal may seem to you, just encourage it. It is this future thinking that will be critical to their success.